CME: This issue includes 4 AMA PRA Category 1 Credits™; 4 ACEP Category 1 credits, 4 AAP Prescribed credits, and 4 AOA Category 2A or 2B CME credits. Point-of-care ultrasound is becoming more prevalent in pediatric emergency departments as a critical adjunct to both diagnosis and procedure guidance. It is cost-effective, safe for unstable patients, and easily repeatable as a patient's clinical status changes. Point-of-care ultrasound does not expose the patient to ionizing radiation and may obviate the need for procedural sedation. Because the use of point-of-care ultrasound in pediatric emergency medicine is relatively new, the body of literature evaluating its utility is small, but grow­ing. 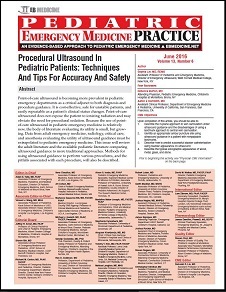 Data from adult emergency medicine, radiology, critical care, and anesthesia evaluating the utility of ultrasound guidance must be extrapolated to pediatric emergency medicine. This issue will review the adult literature and the available pediatric literature comparing ultrasound guidance to more traditional approaches. Methods for using ultrasound guidance to perform various procedures, and the pitfalls associated with each procedure, will also be described. Ultrasound is an ideal imaging modality in children for many reasons. Obtaining optimal ultrasound images in pediatric patients is easier because children are generally thinner and smaller than adults. POCUS is performed at the bedside and can be repeated as needed as a patient’s clinical condition changes. This portability adds a safety factor to POCUS, as potentially unstable patients do not need to go to the radiology suite for a formal radiological study. In addition, unlike computed tomography (CT) and magnetic resonance imaging, bedside ultrasound allows caregivers and staff members from child life to remain with patients throughout the examination, which may obviate the need for sedation. Most importantly, ultrasound does not expose a child to any ionizing radiation.